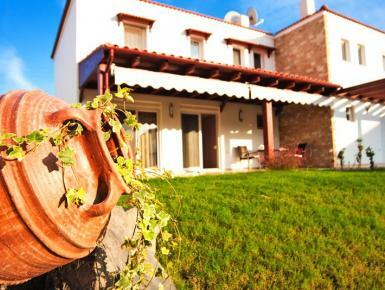 Enjoy a comfort Stay on Rhodes at the Kolymbia Residence houses. The house is part of a project of modern Greek-style houses. Located only 400 meter from the beach and on walking distance of everything you need for a nice holidays and a comfortable stay. Build on 9000 sqm, the semi-detached houses surround a 125 sqm swimming pool, which is filled up from the end of may til the end of september. There is aircondition on the ground floor & bedrooms. There are patios in the front and on the back of the house and the rest of the land is green grass and some olive trees with mountain view. Air condition in all bedrooms and living room.